How might we redesign “home” or “housing” for transitional foster youth? Upon turning 18, foster youth face the extremely difficult challenge of transitioning or aging out of the foster care system. As participant and co-organizer of The Social Impact Lab and the OpenIDEO Portland Chapter, I was connected with the local non-profit Solutions PDX and a motivated group of former foster youth who shared the goal of supporting youth transitioning out of foster care. Youth may not be aware of what housing opportunities are available to them. How might we improve the ways that foster youth and their advocates access and share information and resources about housing? In order to check off these three very important boxes, we felt that only an online digital resource could do it all in a scalable way. But we didn’t want to lose sight of how important it is for youth to receive personalized, face-to-face help. We created a wireframe for what we are calling the Oregon Foster Youth (OFY) Resource Hub. It would be a mobile-optimized website or app that provides accurate, up-to-date, and relevant information for Oregon foster youth and their advocates. 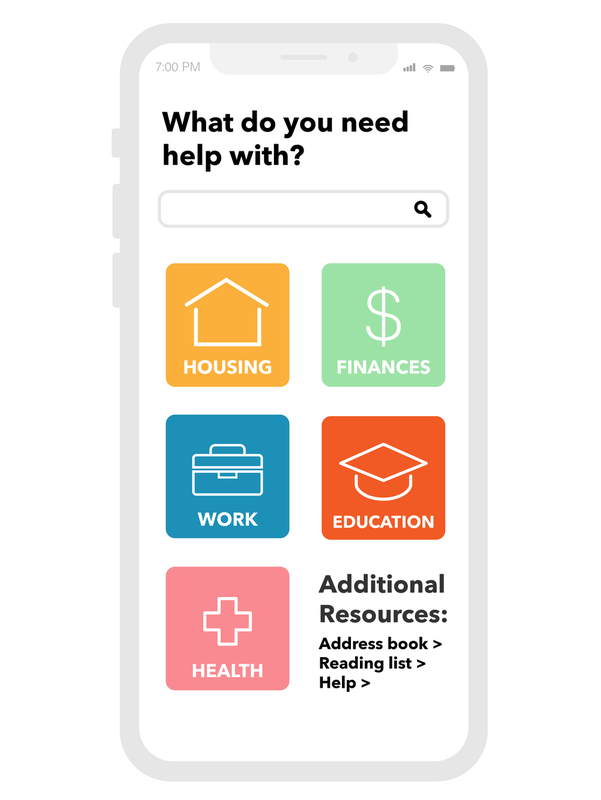 Youth and advocates may peruse the app independently, or make use of a number of features that encourage them to connect, or to reach out to others for face-to-face help. Here’s how we reimagined Nora’s journey to find housing (from the empathize phase) using the Resource Hub. Nora wants to get started finding affordable housing, but cannot meet with her mentor until next week. She decides to use the OFY Resource Hub to learn more about the housing on her own. When Nora opens the Hub, she answers some personal questions so she’ll only see information that is relevant to her situation. She creates a profile that reflects that she is over 18, a full-time student, and has a part-time job. Once on the home screen, Nora sees the search bar, which she would normally use when looking up a specific question on Google. Since she doesn’t have a specific question right now, she selects the Housing icon. Nora sees information for the housing category, laid out in simple, digestible steps. Because Nora created a Resource Hub profile and account, she may see a screen like this next time she visits the Housing category page. She can pick back up where she left off in her housing process, and she may also opt to receive reminders about the different steps. Nora clicks on one of the steps to open a helpful resource. It presents detailed information about how to find housing, along with multiple connection opportunities that will put her in touch with advocates who can help her with her progress. The next step for this project is to test our prototype and validate that it could be an appropriate solution for the youth and advocates we are trying to serve. We hope to work with Solutions PDX to get this phase underway in 2019. For me, designing for social impact extends beyond the project you see here. As a volunteer organizer of the OpenIDEO Portland Chapter, I work with a team to host monthly events and workshops that connect Portland talent to social impact design thinking challenges. Part of that effort includes co-organizing the Social Impact Lab, which in itself is an experience that we are iterating upon, designing, and testing. We are looking forward to introducing another session of the lab in 2019!